If you want to create customized barcode labels for business needs and looking for effective barcode label creator tool, your search stops here! We at businessbarcode.com provide Barcode Maker Software to design and create customized barcode images according to your specific need and requirements. Business barcode generator tool create printable and scannable barcode graphics of any shape, size and color with support to all printers and scanners. All products are bar-coded in this present market ranging from small to large industries and if you want to speed-up, your business rather than wasting time in managing data entry process manually, Download and Install the application available on website. Barcodes asset or tags are used extensively in various areas ranging from Warehousing and distribution, Retail sector, Shipping-packaging, Libraries, Telecom sector, Blood banks, Super markets and other various organizations. Select Barcode font type (Linear or 2D) to design barcode image with color settings as per need. 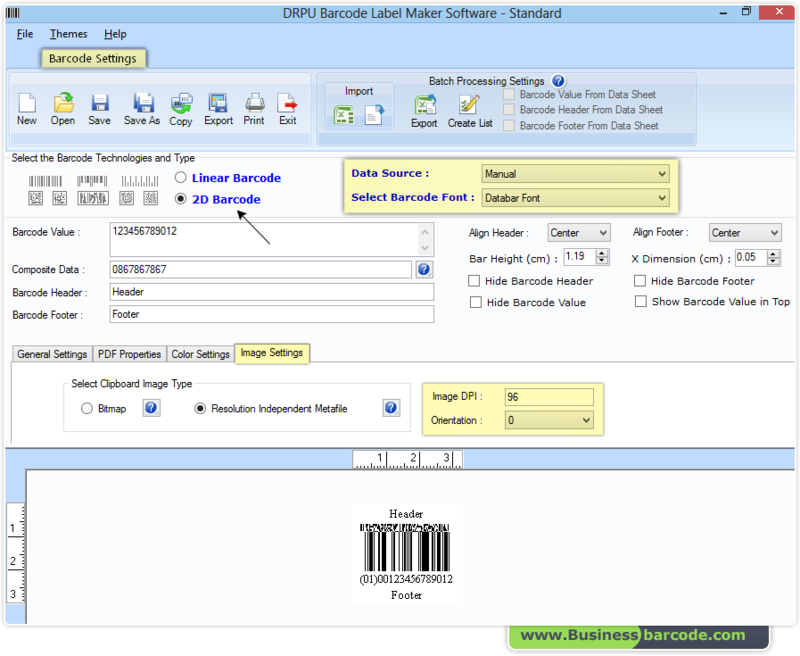 Barcode printer software provides option to print bulk barcodes or multi-copies of same barcode in a single paper. Facility to use barcode images in different Windows applications (Word, Paint, Excel etc). Save barcode images in major file formats like jpeg, tiff, bmp, png, wmf, emf, exif and gif. Barcodes generator support industry standard barcode font symbologies. Codabar, Code 11, Code 128, Code 128 SET A, Code 128 SET B, Code 128 SET C, Code 39, Code 93, Code 39 Full ASCII, EAN13, EAN8, Industrial 2 of 5, Interleaved 2 of 5, ISBN 13, ITF-14, LOGMARS, MSI Plessey, Planet, Postnet, Standard 2 of 5, UCC/EAN-128, UPCA, UPCE, USPS Sack Label, USPS Tray Label, USS-93 and Telepen. Aztec, Databar, Databar Code 128, Databar Code 128 Set A, Databar Code 128 Set B, Databar Code 128 Set C, Databar Expanded, Databar Limited, Databar Stacked, Databar Stacked Omni, Databar Truncated, Databar EAN 13, Databar EAN 8, Databar MicroPDF417, Databar PDF417, Databar UPCA, Databar UPCE, DataMatrix, MaxiCode, PDF417, QR Code and MICR.